The European Union Delegation to Korea hosted a panel seminar on the security dynamics on the Korean Peninsula and EU-Korea partnership on May 28, joined by high-profile experts, scholars and former and current diplomats. The event, “Towards Peace on the Korean Peninsula and the EU-ROK Partnership,” at Seoul Square Building, also marked the launch of the Korea Foundation-Vrije Universiteit Brussel Korea Chair. Participating discussants included EU Ambassador to Korea Michael Reiterer; Director General of European Affairs at the Korean Ministry of Foreign Affairs, Jung Ki-hong; former South Korean Foreign Minister and Professor Emeritus at Seoul National University, Yoon Young-kwan; former South Korean Vice Foreign Minister and Professor at Korea University, Kim Sung-han; and KF-VUB Korea Chair at the Institute for European Studies at Vrije Universiteit Brussel, Dr. Ramon Pacheco Pardo. The discussion was moderated by Minister Counsellor at the EU Delegation to Korea, Dr. Joelle Hivonnet. 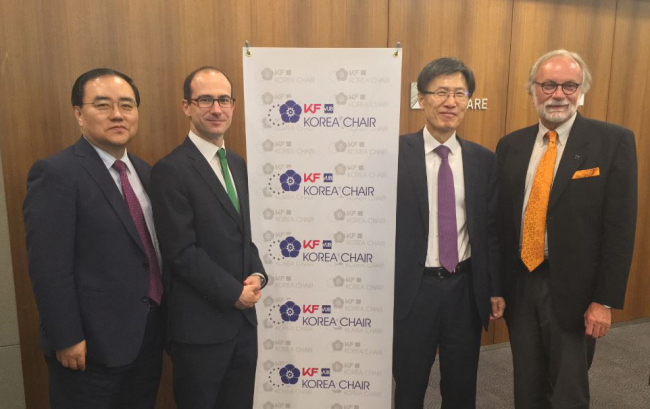 After welcoming remarks by Reiterer, Jung gave an opening address expressing his optimism at the establishment of the KF-VUB Korea Chair in Brussels, the first of its kind outside Washington DC. Subsequently, a panel discussion delved into the recent developments in inter-Korean relations, prospects for the prospective upcoming US-North Korea summit and the role of the EU in the Korean peace process. According to Yoon, three important issues remain unresolved: the precise sequencing of a potential denuclearization process, the verification of faithful implementation of any agreement reached and the definition of security guarantees to the North Korean regime. “The EU can provide technical expertise in developing the North Korean economy and can act as a guarantor for any agreement reached on denuclearization and peace,” said Yoon. There are three reasons that brought North Korea to the negotiation table, argued Kim: China’s implementation of sanctions, the US’ policy of maximum pressure, and South Korea’s proactive diplomacy to build bridges between North Korea and the international community. Kim also said he did not expect the US-North Korean summit to produce any significant and positive results. As for the EU’s role in the North Korea diplomacy, Kim pointed to the EU’s track record of addressing human rights issues as well as ability to aid North Korea’s economic development. Dr. Ramon Pacheco Pardo laid out several ways in which the EU can contribute to peace and stability on the Korean Peninsula. Finally, the scholar said, the European business community has expressed its clear interest in helping the economic development of North Korea. “Europeans are eager to have their voice heard throughout the process, and to be an actual player as opposed to merely a payer,” he noted, adding that Brussels supports the South Korean government’s proactive North Korea policy. Following a short question and answer session, Reiterer concluded the discussion by emphasizing the EU’s firm belief in multilateralism. “When one is dealing with a highly complex issue such as the North Korean nuclear question, it is helpful to have more partners to an agreement to protect it from the effects of unilateral defection,” he said.